The year 1995 - Status Quo celebrated the 30th anniversary of Rick Parfitt and Francis Rossi meeting each other the first time in Minehead, Butlins. A picture book "Quotographs" was published by Bob Young and a new single "When you walk in the room", was released. A second collaboration with the football-team of Manchester United saw the single "We're gonna do it again". But the band is also "on the road" and is doing what they can do best - live shows. And its a remarkable year for the german speaking Status Quo-Fans, because its the first time that the "Rockers Rollin"-newsletter was released. It was a monthly one-page newsletter including the latest information about the band. Until the year 2001 54 newsletters were published by the brothers Michael and Franz Engels and later with the help of Till Langhorst. 07.01.1995: Status Quo are guests in the german SAT1-Show "Pack die Zahnbürste ein". The band performed the song "Going Nowhere". The show was originally recorded on 13th October 1994. January 1995: the "Full Quota"-fanzine Issue 12 was published. Again it included 36 pages. Contents: reports of the Thirsty Work Tour, a year review, backstage with the crew, a summary of Radio Sessions in the 60's. February 1995: first time the "Rockers Rollin"-Newsletter written by Michael and Franz Engels from Kaiserslautern (later with the help of Till Langhorst) appeared. The newsletter which is written in german included comprehensive informations and facts around Status Quo such as tour dates, releases and other things. Until 2001 the german speaking Quo-Fans were best informed with Status Quo news. 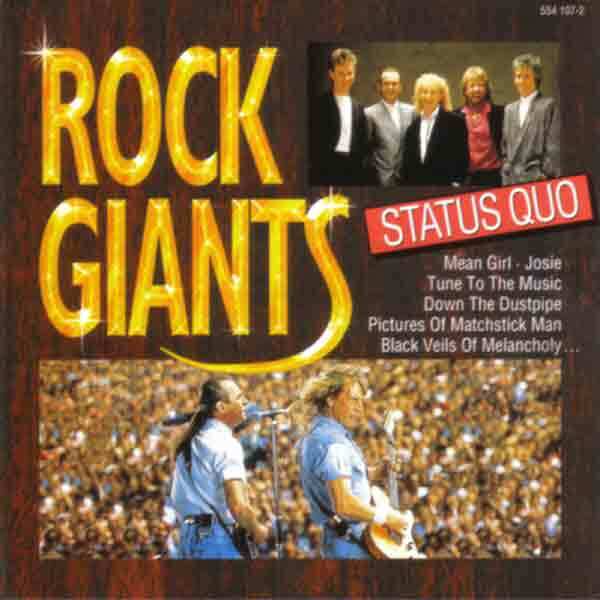 06.03.1995: the Connnoiseur-Label released the Status Quo compilation "The Other Side of Status Quo". A very interesting compilation because some Quo songs appeared the first time on an official release. Such songs as b-sides and rarities. März 1995: the "Rockers Rollin"-Newsletter No.2 was published. März 1995: Alan Lancaster compilation "Life after Quo" was released by Shawbury Music. The compilation included songs which he wrote with The Party Boys and The Bombers. April 1995: Nicola Lisle published their 13. "Full Quota" magazine. On 36 pages you can read: Alan Lancaster Story, a listing of the Rossi/Young songs, the Status Quo Story part 9, the Radio-Sessions of the 60's - part 2. May 1995: the "Rockers Rollin"-Newsletter No.3 was published. May 1995: a scheduled tour through the Orient (e.g. India) had to be cancelled by short hand because of problems with the promoter. 17.06.1995: Status Quo's performance at the Luneburg-Festival was filmed by german TV N3. This festival was the kick-off of the so called "Rock over Germany '95"-series and in Luneburg the line-up was Sheryl Crow, Wolfgang Niedecken (german singer) and Elton John. 23.06.1995: Status Quo played for free at the Niedersachsen-Tag in Oldenburg. 24.06.1995: the german N3-television is broadcasting the "Rock over Germany"-Festival from Luneburg. The songs from Status Quo were "Rockin all over the world" and "Whatever you want". June 1995: a special of the "Rock over Germany"-Festival due to be in Munich is broadcasted via german television Bayern3. 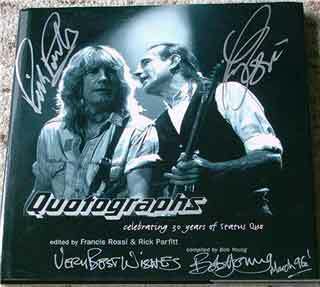 Both Rick Parfitt and Francis Rossi are interviewed about the festival and their long career. June 1995: the "Rockers Rollin"-Newsletter No.4 was published. This time with the announcement of a german-tour for October 1995. June 1995: the new issue of the offical fanclub "From the makers of..." Vol.2 No.1 was published. Beside the news section the main part of the new fanzine included an interview with the band. The questions were asked by fanclub members. The Status Quo expert Dave Oxley with a very good write-up of current Status Quo releases. 02.07.1995: german HR3-Fernsehen is broadcasting a summary of the "Rock over Germany"-Festival in Schwalmstadt. And Status Quo was featured with the song "Rockin all over the world". July 1995: the "Full Quota"-magazine Issue 14 is out. The 36-pages contained a news-section, a section about releases "all over the world" from Garry Fielding and a good part of the magazine is dedicated to the 30th anniversary of the band with reviews and again there were tour reports about recent shows. July 1995: the "Rockers Rollin"-Newsletter No.5 was published. 27.08.1995: Status Quo are headlining the "Decades of Rock" festival in Cwambran/Wales. On this festival they got in touch with the girls band "Dear Jon", who soon were signed as next support band on Status Quo's "Don't Stop" tour at the end of the year. August 1995: the news came up, that the band is working on a complete covers album which they wanted to release for their 30th anniversary. And also the announcement that the next single release is the song "When you walk in the room" due to be out on 23rd of October. August 1995: the "Rockers Rollin"-Newsletter No.6 was published. September 1995: the band is in recording studios and the announced Germany tour in October was cancelled and rescheduled for May 1996. September 1995: the "Rockers Rollin"-Newsletter No.7 was published. 01./02.10.1995: there's a fan meeting of the australian Status Quo fans in Sydney, Australia. 23.10.1995: first single release of the year in UK - "When you walk in the room". Its the first Status Quo single release on the Polygram TV label. (Cat.No. Polygram CD 577212-2; Picture disc 577212-7 and cassette 577212-4). The song is originally recorded by Jackie de Shannon, who released this song as b-side of his single "Til you'll say you be mine". 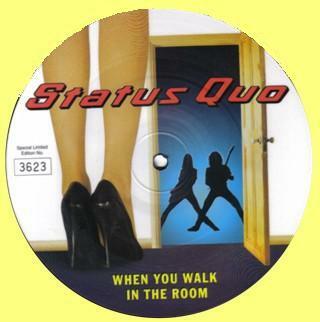 Status Quo's Picture Disc (see picture above) was issued in limited edition with each disc numbered. The b-side is the song "Tilting at the mill", which was written by all band members. 30.10.1995: UK charts-entry of the new single. The single reached a No.34 position. October 1995: the "Rockers Rollin"-Newsletter No.8 was published. 27.11.1995: Status Quo kicked off their annual UK-Tour in Manchester which was called "Don't Stop". It's the name of the covers album which was due to be out in February 1996 and the tour name should say "(please) Don't Stop Status Quo after 30 years". Until December 17 the band played 18 shows. Special guest are "Dear Jon". November 1995: its the last time that Nicola Lisle published her excellent "Full Quota"-magazine issue 15. Nicola Lisle was disappointed with the new musical direction of the band and the then best Status Quo fanzine came to an end. If she reads this - congratulation for a real stunning work. December 1995: the new fanzine of the official fanclub "From the makers of..." Vol.2 No.2 was published. Most important news for all fanclub members: January 28th, 1996 is a special fanclub concert at Brixton Academy where the band is introducing all songs of the forthcoming album "Don't stop" followed by a usual Quo gig. December 1995: the "Rockers Rollin" Newsletter No.9 was published. in Denmark the Best of-CD "Whatever you want" (Cat.No. : Vertigo 526764-2) was released. It's the same cover as the cover of the "Rockin all over the years"-Album but in grey. The compilation is a big success - it went to No.3 of the danish charts. Japan: the japanese Victor Label released the Status Quo compilation "Ma Kelly's Greasy Spoonful Collection" (Cat.No. : VICP 5578). The CD included 8 songs from the "Ma Kelly" album with 11 bonus tracks. The cover is made out of "Best of"-LP and the "Quotations"-LP.